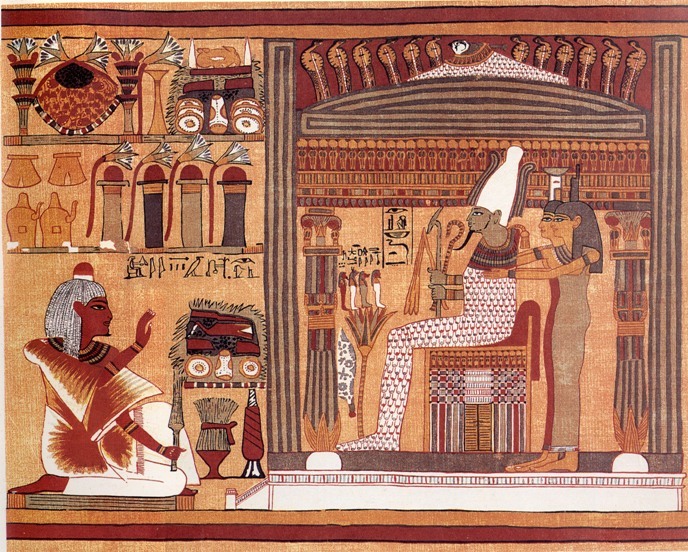 Isis and Nephthys overlaped in a Papyrus from Turin. The artists of Ancient Egypt had a particular conception of perspective, which affected in the way they depicted groups of living beings and amounts of things. Book of the Dead of Khonsumes. Isis and Nephthys juxtaposed behind Osiris. In our last posts we saw how in Ancient Egypt the funerary scene of Osiris being flanked by Isis and Nephthys was usually depicted with the two mourners of Osiris juxtaposed. It allowed to draw Isis always preceding her sister Nephthys and to make both images complete, so effective for the dead’s resurrection. But the ancient Egyptian artisan could also use the technique of superposition for drawing collectives of people (troops, groups of workers…), of animals (for instance flocks) or amounts of objects (offerings, vases…). The superposition was also applied to the scene of Isis and Nephthys behind the resurrected Osiris on his throne. We can see it for instance in the famous Papyrus of Ani from the XIX Dynasty and in many others. The superposition meant that one of the two mourners of Osiris remained almost hidden behind the other, so her effectiveness was reduced. The reasons then, if there was some, for using this technique instead the juxtaposition remain unclear. Maybe a matter of lack of space? Who knows! The point is that it seems that the artist of Ancient Egypt found the manner of using this scene with the superposition in a most effective way. Papyrus of Ani. Osiris flanked behind by Isis and Nephthys in superposition. British Museum. Looking at many examples of papyrus we notice that usually Isis was depicted on the forefront, letting the figure of Nephthys in the background and recognizable thanks to her name on her head. It is widely assumed that with the superposition the ancient Egyptian artisan could indicate distance, so being the figure in first plan the closest in the visual plan. But it could also be a way of indicating importance; so the first plan was reserved for the most relevant figure. Depicting Isis and Nephthys together in a reduced space. 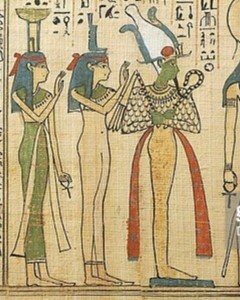 Depicting Isis in the foreground and indicating her importance in the dead’s regeneration.